Growing up both our parents had holiday cabins in Echuca on the Murray River. Our cabins were two doors down from each other. We had spent every summer together since we were 12 as friends and on the night of new year's 2007-2008 Nigel finally made a move. We spent a great summer together, however on 12 January 2008 Nigel moved to Queensland to finish his apprenticeship. We continued a long distance relationship only seeing each other once a month. After his second trip down when we both had to say goodbye we both felt this feeling and we just knew that this was more than a summer fling! Nigel tricked me into going to his parents' cabin where we first met to do some maintenance work. When we arrived he opened the door and there was a big bunch of flowers on the kitchen bench. When I went to see why they were there I turned around to find him on one knee with a beautiful ring in his hand. He had made a 4 hour return journey the night prior to set everything up for the big moment. The proposal was followed by a beautiful lunch at Oscars on the Port of Echuca. We wanted a wedding that everyone would remember. We wanted to go away to a tropical paradise and for our guests to have the most memorable event they have ever been to. I wanted the venue to speak for itself, something that one could only dream about and wish to visit. I was after sea views with something different. In terms of colours and style I wanted everything to complement the venue. 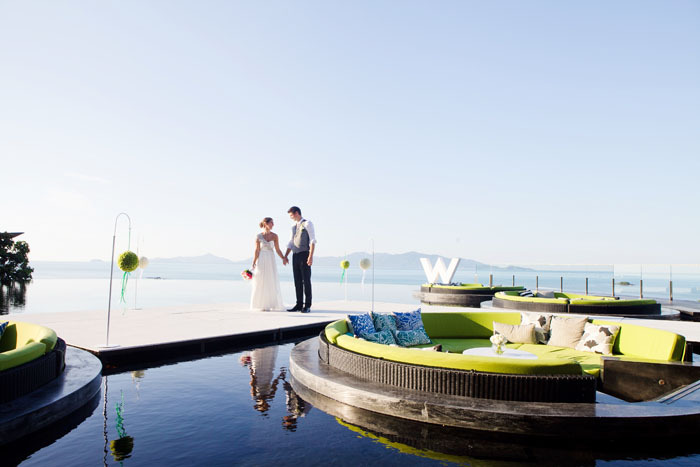 Our ceremony was held at W Retreat Koh Samui on top of the lotus pond overlooking the ocean. The first time we saw the venue we knew that we had to utilise this amazing space. We arranged with the venue to build a stage on top of the pond allowing our guests to sit around and watch in an intimate setting. We celebrated our reception down on the beach at the W Retreat Koh Samui. Tables were set under the stars in the sand with the sound of waves crashing. As not all my guests could travel to Thailand we had a kitchen tea at home prior to travelling. All our guests arrived in Thailand a few days prior so we had many group pre-wedding activities and even arranged a notice board with the hotel to keep everyone informed. Guests did tours, fishing charters and other adventure activities. The night prior to the wedding the ladies all went out for a lovely dinner on the beach and the boys hit the pub. After the ladies finished dinner we all went to the local beauty spa and spent the evening lapping up the luxuries of Thailand with manicures, pedicures and full body massages. My wedding gown was a light silk flowy dress. As we were in a tropical climate I didn't want anything heavy. My dress was made by Anna Campbell. I had met Anna a few years prior as she had designed my best friend's wedding dress and as we had such a great relationship with Anna it was very fitting to go back to have her design my dress. I was inspired by the venue and destination. I also love a bit of bling and the dress I chose was everything I hoped it would be. My bridesmaids also wore dresses by Anna Campbell. Anna had a stocktake sale so I rallied the troops and we arrived early morning ready to take on the sale. As we had experience with Anna's dresses before I knew what I was after. As soon as the doors opened we raced inside grabbed three dresses in the shell colour and used the bits and pieces Anna was selling to make three slightly different dresses. As it was a sale two of the dresses were long, so we had them all cut to one length. All up the three dresses and flower girl dress cost me $350 - bargain. Initially I wanted to get all the boys entire suits made in Thailand, however I didn't want to take the risk and opted for Politix shirts and vests. To save on costs I purchased these during the Boxing Day sale. On arrival in Thailand I raced all the boys to the tailor where we had pants made for each of them. As we were in Thailand we were lucky enough to have a wonderful planner who provided me with many pictures of lovely bouquets and all I had to do was pick which one I wanted. I opted for pink and white lilies. As the venue for the reception was unique it didn't really require much decoration. We had hanging lanterns which hung overhead the tables with flower centrepieces that matched my bouquet and candles. We had a large seafood BBQ buffet on the beach. The buffet included rock lobster, fish, beef, chicken, salads, hot dishes and finished with an amazing dessert buffet which included a chocolate fountain. All our guests received stubby coolers with an image of the venue, we also had grass leaf fans for all the ladies. Karen and I used to work together in QLD and would spend weekends chatting together as she was just starting her photography business. To help build her portfolio Karen asked Nigel and I to do a portrait session three years before our wedding. The photos from the portrait were just amazing and I knew that I wouldn't want anyone else to shoot our wedding other than Karen. Both Karen and her husband joined us at the wedding, as guest and photographer. I love that our wedding photos capture the emotion and the moments. It's such a great way to remember the special day as it goes so quickly. We pre-purchased sky lanterns for all our guests which they released into the sky. It was amazing to look up into the sky and see all these beautiful glowing lanterns light up the ocean. One little thing that sticks in my mind is that Nigel and I did dance lessons for our first dance and half way through our reception Nigel pulled me to the side and asked if we could do a quick practice down on the beach. It was such a gorgeous moment between the two of us. Our dance finished with me sitting on Nigel's lap and as I sat down I had arranged for a firework to be released - which made it very magical. This was followed by an entire fireworks display. Another memorable moment was the out of this world fire dance trio. We most likely wouldn't have the opportunity to travel with so many friends and family again so we decided that we wouldn't have a couple honeymoon and spent the rest of our trip in Koh Samui and Phuket with all our guests. We did spend our wedding night and another night alone together at W Retreat before returning to the group.